Meuse (left) has made it two wins from as many starts with a resolute victory at Caulfield. A step up to stakes grade looms for two-year-old Meuse after the talented filly made it two wins from as many starts with a city success at Caulfield. 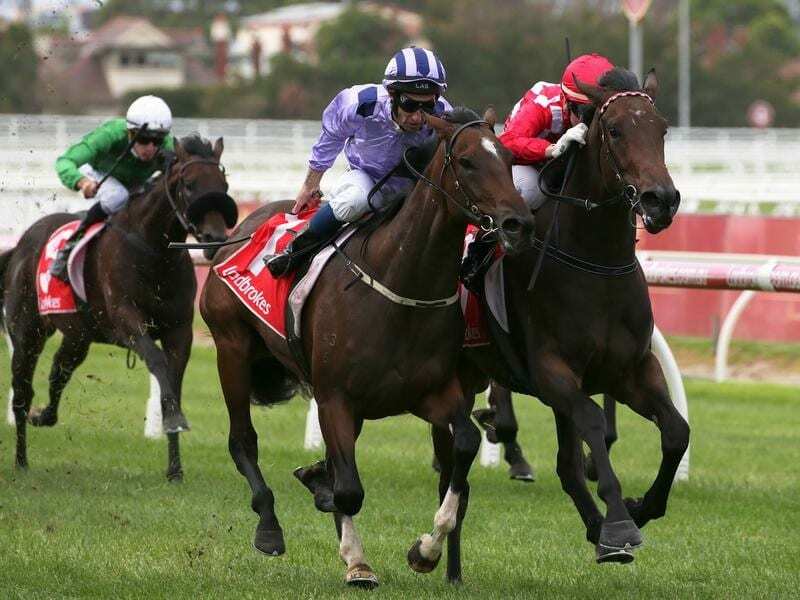 The Anthony Freedman-trained Meuse won comfortably on debut in a Bendigo maiden on March 19 and stepped out again in Saturday’s Thomas North Handicap (1100m) for two-year-olds at Caulfield and knuckled down to her task late to win narrowly. The stable has pinpointed the Group Three Breeders’ Stakes (1200m) in Adelaide on April 27 as the first chance for the daughter of Snitzel out of Precious Lorraine to try to secure valuable black-type. Ridden by James Winks, Meuse, the $3.60 favourite, sat in behind the leaders and took all of the straight to reel in debutante Flostar ($8.50) to score by a short head with Memphis Rock ($7) another three-quarters of a length away third. “It was a good effort,” Freedman’s racing manager Brad Taylor said. “She still wanted to do a few things wrong and needed every inch of the 1100 metres to get there. “She is a filly who will progress on and we’ll have a crack at black type now. There’s a nice Group Three race in Adelaide coming up for her in three weeks. Taylor said Meuse could develop into a Thousand Guineas-type filly in the spring.